I have another True Blood inspired mesh for you Jessica wore a tiny corset style top with skinnies and platform heels. It's not exact, but close enough for my game. The mesh has fat and preg morphs. ETA-The heels are Sentate's edited to fit the shape. OMG. Jessica had a baby! Congrats, Jess. And thanks for the outfit, Cynnix! 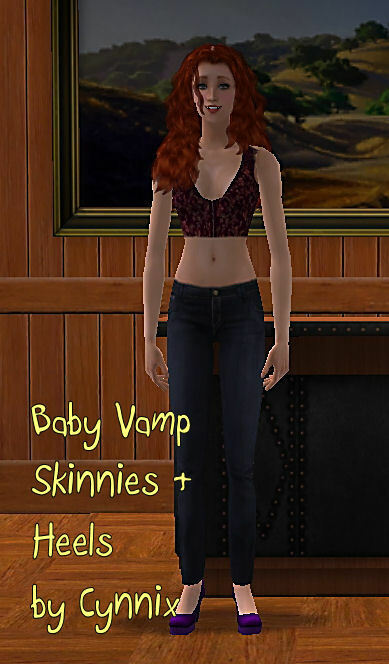 I'm always needing clothes for this baby vamp and her constantly evolving fashion sense. This will do wonderfully. fanseelamb;16161 Wrote: OMG. Jessica had a baby! Congrats, Jess. OMG. That's SO wrong. Congrats to the happy parents.